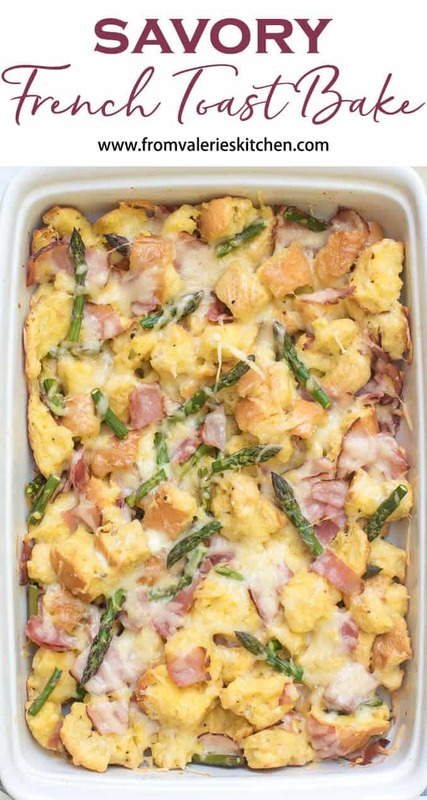 This Savory French Toast Bake is loaded with ham, Swiss cheese and asparagus all baked together in a casserole dish. 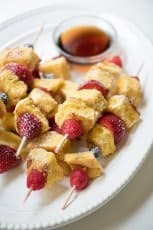 An excellent option for a holiday brunch but easy enough to make any day of the week! Friends, get ready for a delicious treat. 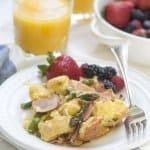 If you prefer savory over sweet when it comes to breakfast, this recipe is for you! 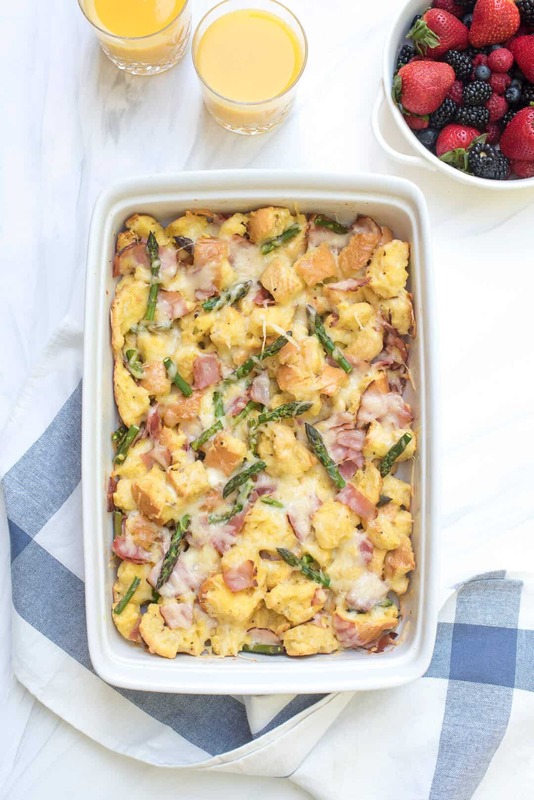 This breakfast casserole is a real crowd-pleaser that can be made ahead and reheated when needed. 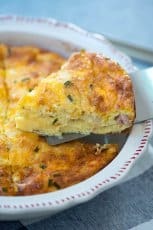 Perfect for busy weekdays or a holiday brunch. I was so excited to receive a copy of Mary Younkin’s newest cookbook, The Weekday Lunches & Breakfasts Cookbook, in the mail several weeks ago. In addition to being a blogger and cookbook author, Mary is also one of the warmest, most supportive people I’ve met since I started in this business 7 years ago. She’s a doll, a gem, a sweetheart of a lady! 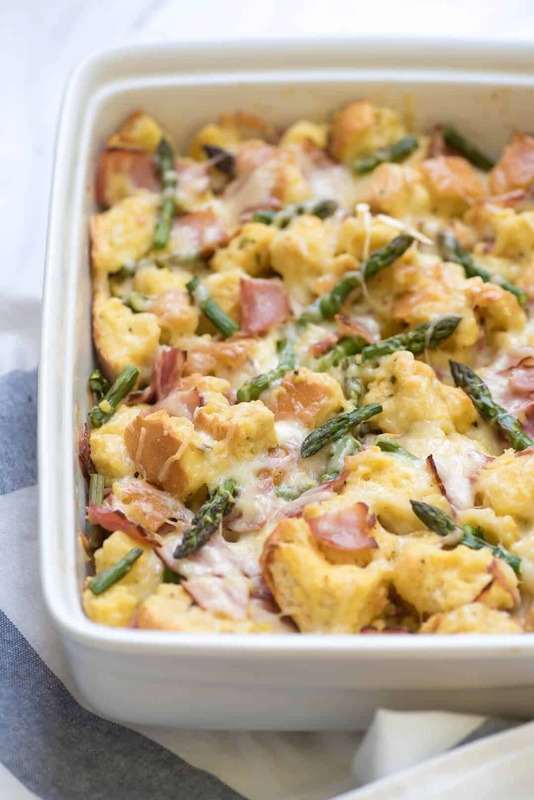 Flipping through her book, this Savory French Toast Bake caught my eye right off the bat and I can tell you now, it is just as delicious as it looks. It was also super easy to put together. The book is full of the kind of recipes I need the most. Practical, approachable, family-friendly meals. Mary has included sections devoted to Make-Ahead Lunches, Quick and Easy Breakfasts, Make-Ahead Breakfasts, and Sweet and Savory Snacks. So many of these categories are overlooked in other cookbooks so this is truly an awesome resource. The recipes are easy to follow and include gorgeous color photos that will make you want to try every… single… one. 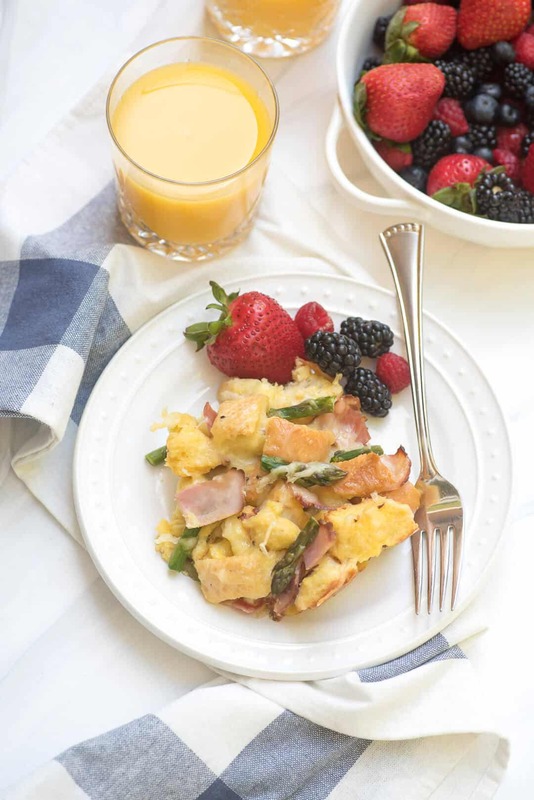 Mary’s first book, The Weeknight Dinner Cookbook, focuses on simple dinner ideas for busy days and this book follows suit with some equally delicious inspiration for lunches and breakfasts. I’m diving into the Make-Ahead Lunch section next and already have several recipes on my list to try. What a gorgeous choice for a Mother’s Day brunch! Or, make it on a Sunday and package up portions for a quick reheat on busy mornings. See the printable recipe below for all the details. 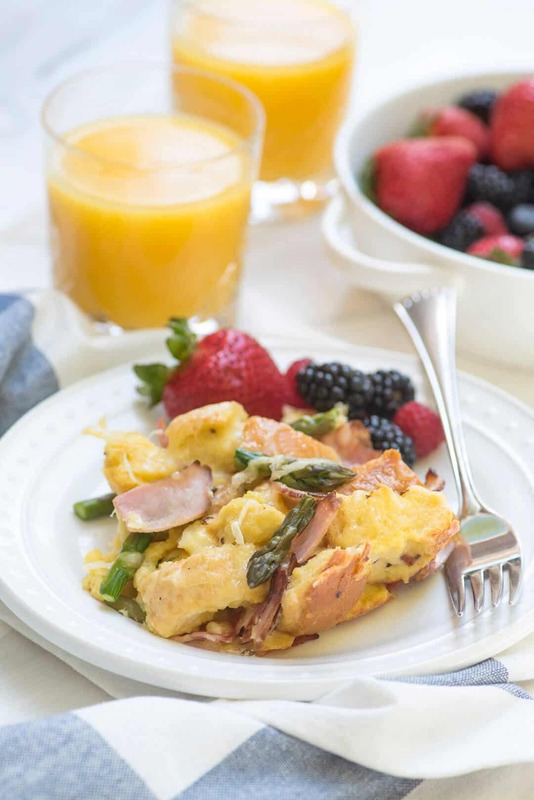 To perfectly round out an all-in-one breakfast casserole like this one, just add some fresh fruit or berries. 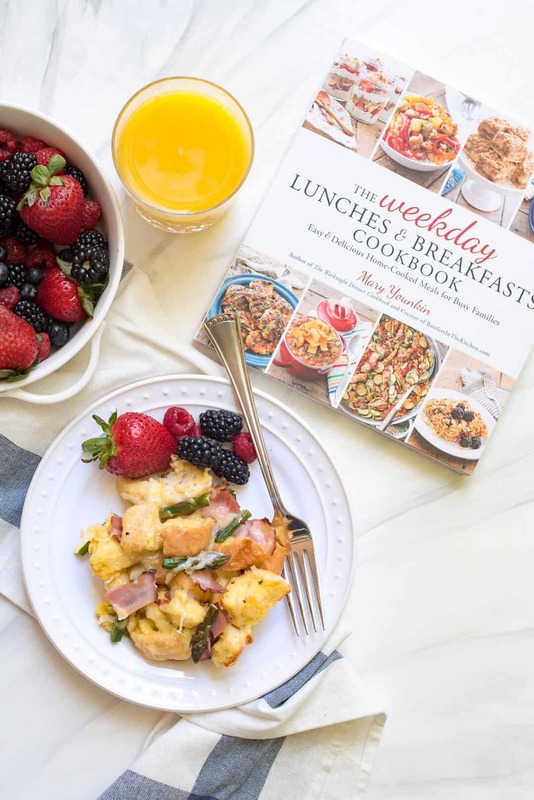 You can find Mary’s cookbook here → The Weekday Lunches & Breakfasts Cookbook. If you don’t know Mary yet, you need to! You’ll find her over at Barefeet in the Kitchen where she shares simple, from-scratch recipes perfect for feeding a family. Coat a 13" x 9" baking dish with non-stick cooking spray and set aside. Use a sharp knife to slice the bread into 1-inch slices and then cut the slices into 1-inch cubes. Place the bread cubes in a large mixing bowl. In a small bowl, lightly whisk the eggs and add the milk, cream, salt, pepper, and granulated garlic or garlic powder. Whisk to combine, and pour the liquid over the bread cubes. Use a large spoon to gently stir and coat all the bread cubes. Add the asparagus, ham, and 1 cup of shredded cheese. Toss once more to evenly distribute the ingredients. Transfer the mixture to the prepared baking dish and make sure the ham and asparagus are distributed throughout. Sprinkle with the remaining cheese. Cover with foil and bake for 30 minutes. Remove the foil and bake for 20 to 22 minutes, uncovered. The bread should be toasted golden brown. Remove from the oven and serve warm. Cover and store any leftovers in the refrigerator. Make-Ahead Directions: Store in an airtight container in the refrigerator for up to 3 days. Reheat in the microwave or covered in the oven. This can be stored in one large container or portioned into individual servings for storage and reheating. This recipe would also work well with broccoli or bell peppers in place of the asparagus. I could eat this every.single.day. Mary’s cookbook is just AMAZING! 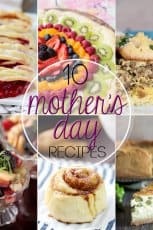 So many awesome recipes! 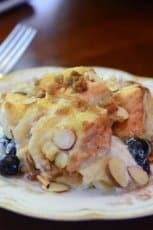 I have never tried a savory French toast, but I am pretty sure I’m missing something amazing! This looks AMAZING! Love the flavor combo. Making this soon! Another yummy recipe to save! Now I know what I will make for breakfast tomorrow! Get in my belly! This looks so good. This needs to happen at my house very soon!! Mary is just the best, isn’t she? This looks amazing! I need to get my hands on that book! Fantastic! So glad you enjoyed it, Laverne! We love this dish so much! I am thrilled that you’re enjoying the cookbook, Valerie. Thanks for your sweet words. I feel so blessed to have met you through this work that we are lucky enough to do! Oh I have never tried french toast this way. Thank you for sharing! Gotta try this recipe and buy the cookbook! Assembled last night and put in the fridge overnight. This was absolutely delicious. We served it with butter and syrup and the sweet-savory was perfection. Will definitely serve this to company. Love that you can make the night before then pop into the oven. We used a French baguette so there was lots of crusty goodness.